Cajun music is thumping and grinding as morning revelers dance a freestyle Zydeco mash-up of mambo, tango, two-step and whatever. Accordion, drums, guitar, fiddle and “frottoir” (washboard) are so boisterous you can’t hear yourself think. Then again, thinking is totally beside the point. Breakfast includes Elmer’s Heavenly Hash – a local pillowy confection of marshmallow, almonds and chocolate. 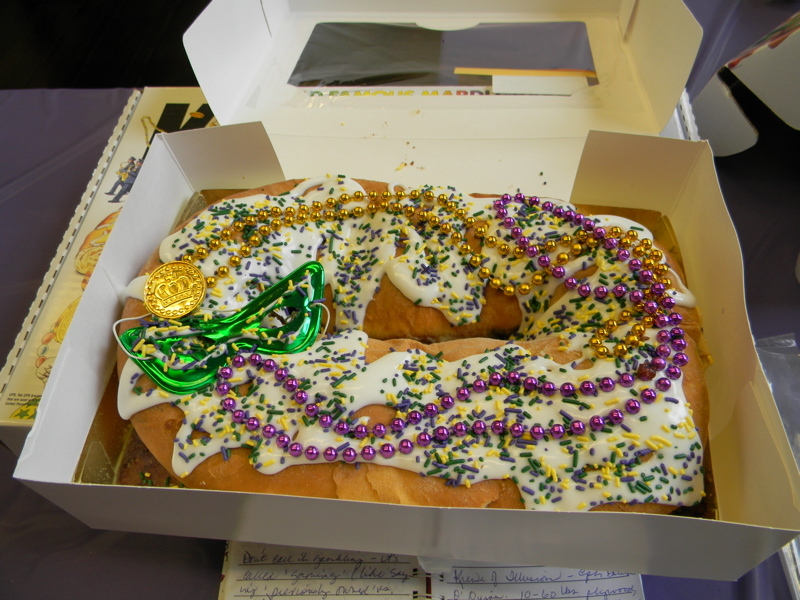 Add a piece of Praline King Cake and you’ve got a heavenly sugar headache just in time for the Mardi Gras parade. Though the weather is iffy, the downtown streets are full of revelers. Kids of all ages, parents, grannies and Gumbeaux Gator himself – everybody’s dancing up a storm. By mid-afternoon the VIP tent is expanding and contracting like a big Cajun bellows. 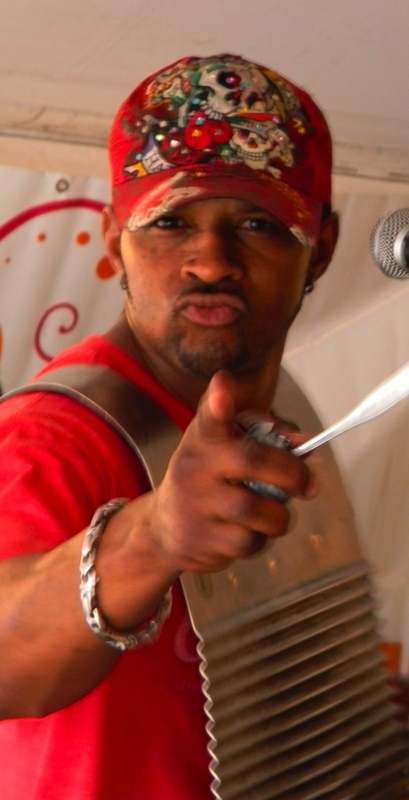 Harold is scraping away on the “frottoir” like nobody’s business with Lil’ Wayne and the Same Ol’ Two Step. Gumbeaux Gator is shaking and shimmying his green bulk in the wet parking lot as well, and like the rest of us he’s added several dozen more necklaces and a few more pounds. Bling, bling and more bling. We indulge in a little Boudin (sausage), crawfish, and cracklins to keep our strength up. I am vegetable-challenged but I’ll eat healthy later, gator. The parade begins. We clap and shout wildly, waving at the bead-throwers as they pass. 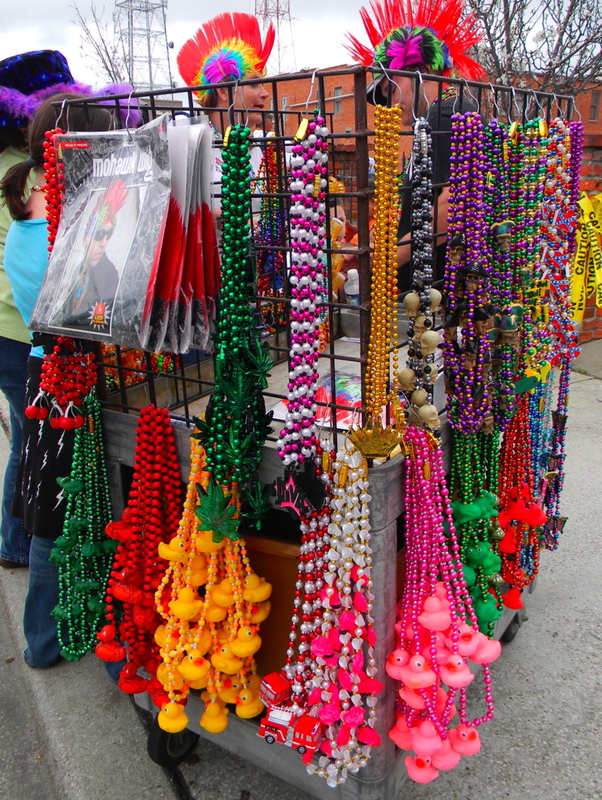 Beads are flying. Some twirl up and drip from power lines like shiny souvenirs. In my enthusiasm, I lose both a diamond from my wedding ring and my voice. This entry was posted in Travel and tagged Bayou, Boudin, breakfast, Cajun, Elmer's Heavenly Hash, epicurean travel, food, gator, getaways, Gumbeaux Gator, gumbo, histoic homes, hospitality, King Cake, Louisiana, Mardi Gras, music, outdoors, parades, southern food, Southern Hospitality, vacations, winter getaways, Zydeco. Bookmark the permalink.